Lou Reed and Sharon Jones, "Sweet Jane"
Once again, Eliot Wagner of Now I've Heard Everything comes through with a great video, this one courtesy of Connie Lynchitz, of Lou Reed and Brooklyn's own Sharon Jones doing the Velvet Underground classic "Sweet Jane" in Sydney. This isn't a live action video; what you get is excellent live in concert audio and still photos of Lou (up for the first half of the song) and Sharon. Lou starts the song, but then Sharon takes over the lead vocal in a stunning performance. Thank you Eliot! Pete Seeger, who died yesterday at 94, was an inspiration to the generation of folksingers who were popular during my high school and college years. While I was in college, I got his album How Can I Keep From Singing, and was particularly fond of the title song, as well as his musical setting of Idris Davies' poem "The Bells of Rhymney," and the Spanish Civil War song Viva la Quince Brigada. I also love his "Garden Song" (video above). He shared his incredible gifts as an artist with anybody and everybody and set an example to all musicians of what our job is all about...to make a contribution while we are here, to honor young people and to show love and exercise responsibility to our blessed planet earth. 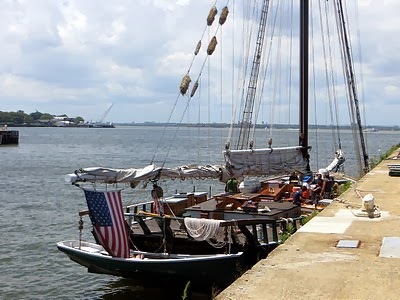 On the subject of "responsibility to our blessed planet earth," Pete championed the restoration and preservation of his beloved Hudson River, and toured along it in the sloop Clearwater, which I photographed when it visited Brooklyn Bridge Park. I'll close this with the words of another Lion's Head alum, Mary Breasted Smyth: "Tonight we will look up at the stars and imagine Orion is holding a banjo." J. 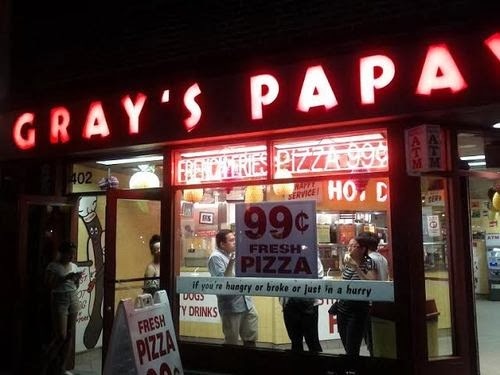 Press gets the New York real estate squeeze; Gray's Papaya in the Village goes down the hatch. This post is about two New York City institutions--although the first is principally a New Haven institution and my first contact with it was in Cambridge, Massachusetts--that have recently disappeared, although in the instance of the first one the disappearance may be temporary, and in the instance of the second it is fortunately not complete. That I'm sorry to see them both go reflects two disparate--some might say incoherent--sides of my personality. My first contact with the clothier J. Press was in the late spring of 1970. I was about to graduate from law school, and needed a suit. Press had a store on Mount Auburn Street in Cambridge, and I'd gotten word that they sold good clothes. I showed up the day after a big Harvard Square anti-war riot, and found that all of the store's windows had been broken and covered with plywood. I was about to turn back, but saw a hand lettered sign by the door: "We're open, please come in." It was a bit gloomy inside, but before long I found a suit I liked, one that spoke to my characteristic desire to achieve two incompatible goals: to be at once conventional and daring. It was a traditional natural shoulder center vented three button with plain fronted trousers in charcoal gray, but with a subtle electric blue windowpane check. As I was trying on the jacket, I said to the salesman, "It looks like you bore the brunt of the attack yesterday." "Oh, yes sir," he said, "I was here through the whole thing. These people, sir, they were the very scum of the earth. You could tell by the way they were dressed." After I graduated and started work at a New York law firm, my suit caught the disapproving eye of a partner who was the firm's unofficial sartorial enforcer. That electric blue check didn't please him. He suggested I try Brooks Brothers. I did; they had a branch conveniently located downtown near my firm's offices. On my first visit there, another man asked a clerk if they had what were then called "permanent press" shirts. "Oh, no sir," the clerk said witheringly, "We are an all cotton store." I bought some sufficiently conservative togs there, though I later managed to push the envelope a bit by getting a dark brown suit with maroon chalk stripes. I also found J. Press's New York store, on 44th Street between Madison and Fifth avenues, just around the corner from Brooks's main store at 346 Madison. I shopped at Press on occasion, although I don't have a clear recollection of what I bought. Vaguely, I can summon from memory a mustard yellow blazer--or was it a blue blazer and mustard yellow slacks? They also had good ties. As years went by, I became more of a Brooks loyalist; I don't recall the last time I went into J. Press, but it was certainly over twenty years ago. A few years ago, I was walking along 44th and saw their storefront was vacant. My heart sank a bit. Though I hadn't shopped there in years, I still cherished the memory of my first encounter with Press in Cambridge. 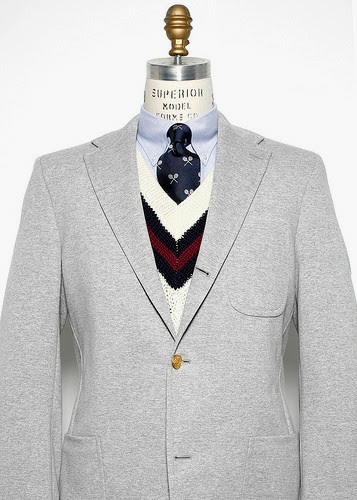 Moreover, I liked their commitment to the classic three button jacket style, as in the photo above, and their willingness to do things a little bit daring, like putting the jacket over a tennis (or cricket) sweater, or like the windowpane check on my suit. I was relieved to learn that they had just moved their store to a new location at Madison and 47th Street. Now I've learned, through the good offices of Francis Morrone, that the store at Madison and 47th has closed because the landlord is renovating the building, although my further research shows that the owners may reopen the store at a different New York location, perhaps in 2015. If they do, I will go there and buy something, even if it's only a tie. Gray's Papaya at Sixth Avenue (that's Avenue of the Americas for non-New Yorkers) and Eighth Street was my resort for a quick and satisfying tummy fill and revitalizing fruit drink on many a decadent Greenwich Village night in my dissolute unmarried days (and a few post-marriage ones, about which my wife had something to say). I always got the "Recession Special" (available no matter what the condition of the GNP, the unemployment rate, or the stock market: $1.95 back in the 1990s* for two dogs, which I always got with mustard and kraut, and a sixteen ounce papaya drink) and left feeling much the better for it, which is more than I can say for most fast food outlets. Walking east toward Sixth, I find only interlopers: sushi bars and designer hair salons; sterile boutique windows lit by laser-tight pins of light; card shops touting ribbons and balloons, any kind of trifle; coffee chains and sandwich franchises, the commerce and character of Village streets having become nearly indistinguishable from any in Cleveland or Wilmington or Naperville. I remember reading somewhere that Lou Reed liked to get his "mystery tubesteaks" at Gray's. Perhaps it's fitting that the Village Gray's died shortly after its perhaps most famous regular customer. At least the Gray's at Broadway and 72nd Street survives for now. Someday soon I'll make the trip to the Upper Left Side. *According to Gothamist, in 2008 Gray's raised the price of the "Recession Special" to $4.45, after previous increases in 2002 and 2006. The article quotes Mr. Gray: "It's always very traumatic for me as well as the customers."